A week ago I went to a trail near what I expected was going to be my second choice in houses to help cement my opinion. I went further than I’ve gone before, continuing on to the Quartz Trail and wandering up to this outcropping of quartz that looks out over Scottsdale. I had a fun morning and confirmed the other house was my first choice but also that I’d be happy living in the second if we didn’t get the first. As you hike through the desert you’ll sometimes cross a wash, an area that is normally dry but where water runs after a storm. I’ve not seen a wash run, it doesn’t take long for the water to stop flowing and the monsoons usually arrive in the evenings when I’m not on the trails due to the heat. 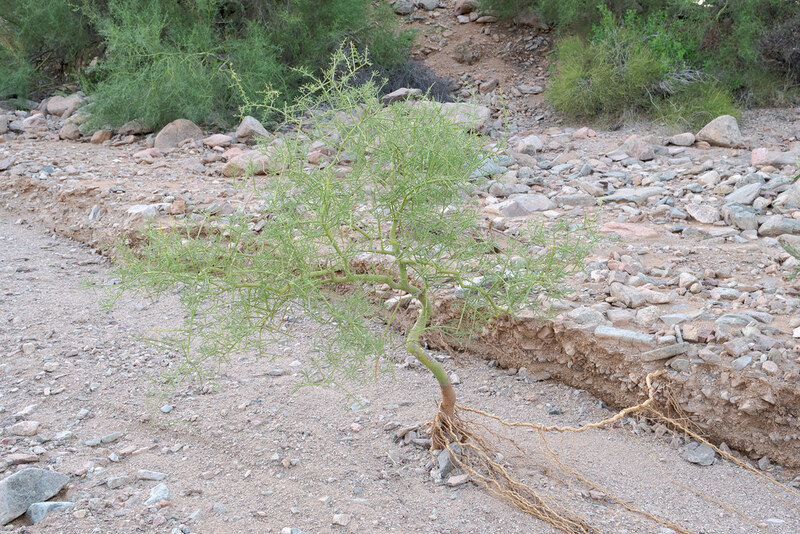 I’ve seen the aftermath though in the scouring of the trails, I wonder if the roots of this foothill palo verde were recently exposed due to erosion after a summer storm. Most of the shallow roots have been stripped of earth and are angled downstream save for one still plugged into the surviving bank. It may not look like it but this little tree has leafed out, the trees have tiny leaves that you can see along the thorns if you look at the top of the tree set against the darker green of the larger trees behind it. You can also see the green bark, the palo verde can photosynthesize its food from both the little leaves when they are present and from the green bark and thorns year round. I’m curious to see if it survives or if it will fade away now that its roots are exposed, and perhaps wash away in a future storm. But for now it is holding on, literally. Even the green bark of a foothill palo verde looks red in the first light of sunrise. 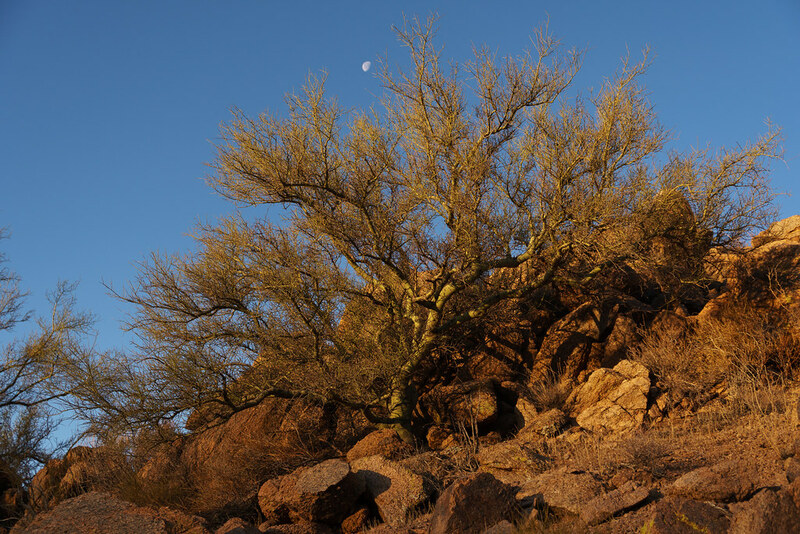 First light falls upon a foothill palo verde tree as the moon hangs above, taken yesterday morning on my first hike of the Sunrise Trail in McDowell Sonoran Preserve. Life has been full of a lot of firsts lately and hiking has been no exception. This morning was the first time I hiked in shorts since arriving here, as I’m testing out when I want to wear short sleeves and shorts based on temperature, and unfortunately it was also the first time I slipped on the trails here. Nothing serious, just skinned up one of my shins, but I don’t think in two decades of hiking in the Northwest I ever drew blood (to be fair I rarely lose my footing). But mostly the firsts have been positive. First time seeing animals, first time seeing plants, first time visiting parks, first time hiking trails. The new Columbia sun hat and new Merrell hiking shoes are both working well, Friday morning I wore the shoes for the first time on a flat hike and by Saturday morning I was confident enough to wear them on this hike of the Sunrise Trail, which is mostly constant elevation change. It was also quite windy so fortunately I had the chinstrap on my hat cinched tight or my new hat would be soaring above the desert even now. We’ve been here four weeks now, though strangely it feels to me like we’ve been in Arizona a month but left Portland months ago. One of the appeals of moving here was the unique beauty of the Sonoran Desert and I’m thankful that not only have I been able to start exploring the desert, but I’ve been out six times! A welcome respite after only getting out once since November while in Oregon. What a blessing it is to be out on the trails. 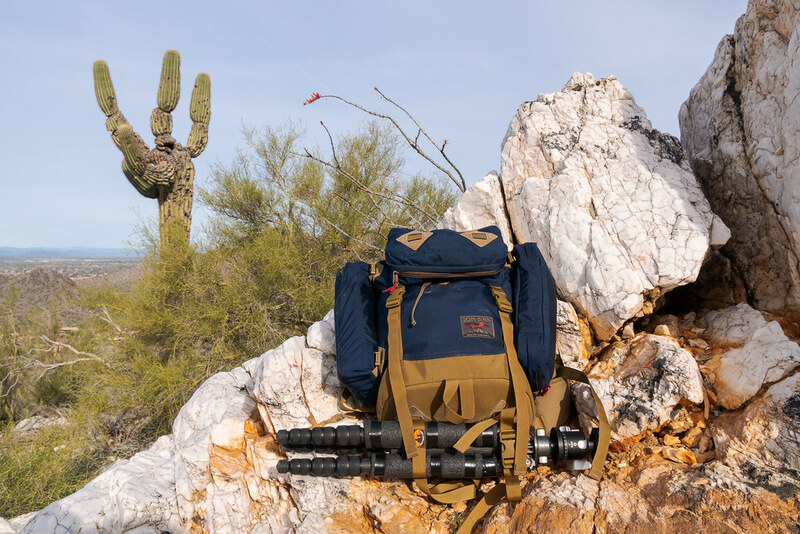 One of the things I looked for in a rental house was easy access both to work and to local hiking trails, thankfully our house is only 15 to 30 minutes from a number of trails, allowing me to explore the desert in spring before the brutal summer heat arrives. While the trees here like this palo verde don’t provide shade, I have found some trails that are shaded in the morning by the surrounding hills, so hopefully those will be tolerable for a couple hours after sunrise even during the summer months. We shall see. In the meantime adjusting to hiking here means adjustments to my hiking gear. I’ve had the same hiking hat my entire time in Oregon, a hat we picked up at REI after we moved there, but after a few hikes in the desert I realized I was going to need a hat designed for the heat. On Friday the Columbia Sportswear Bora Bora II Booney hat arrived and was immediately put to use on both hikes this weekend. I immediately noticed the difference as the new hat is lighter and lets out more heat while keeping out the sun. Loved the old hat and will love the new one. I figure sun hats here are like sunglasses, you’ll want multiple ones so you’re never caught without one when you need it, so I may keep the old hat in the car and maybe pick up a different style of hat as well, but this one I expect to be my main hiking hat. I’ve been wearing a pair of old New Balance trail runners on all my hikes so far, which work well on the flat hikes but on some of the hills I would have preferred a more structured shoe. Both of my pairs of hiking shoes are waterproof and a bit warm for the desert in the summer (they’ll be fine in the winter). Saturday my Merrell Moab 2 Ventilator shoes arrived, I haven’t worn them hiking yet but Saturday night I wore them around the house and they fit well and don’t seem like they’ll need any break-in. I ordered them in black as I like the look despite knowing from the moment I hit the trails they’ll be covered in desert dust from here on out. Saturday morning after returning from my hike I ordered two Klean Kanteen 27 oz water bottles to join the two I’ve had for years (as well as a smaller one) and they arrived that afternoon, a perk of the the Phoenix metro area is Amazon has same-day delivery on some items. They joke about the dry heat but it really is dry here and you have to work harder to stay hydrated. I always try to hike with more water than I’ll need so it was time to up the water bottle ante, the two new bottles were put to use this morning. The Klean Kanteen bottles are sturdy and I’ve never had a leak, which is important to me as they sit next to some expensive camera gear. They come in a variety of colors, really love these bottles. I do miss Portland’s tap water though. My wife picked up a small bottle of sunscreen so I can keep it in my backpack in case I forget to apply it before I leave or if I need to reapply it. I used the same bottle of sunscreen in Oregon for many, many years, as I rarely needed it unless I was above tree line or out on the coast. Here though I never hike without it. I already had some good hot weather hiking shirts, I’m still testing out when I’ll wear long versus short sleeves, and I have a couple pairs of lightweight hiking pants that convert to shorts, so I’m OK there. I did order a long sleeve swim shirt and a new swimsuit, as while I haven’t swum much the past thirty years, that’s about to change and I enjoyed testing them out in our pool this afternoon. A quick dip in the pool to cool off, and to get some exercise even in the heat, that I think I’ll love. Lots of pictures to come, this desert really is something special. 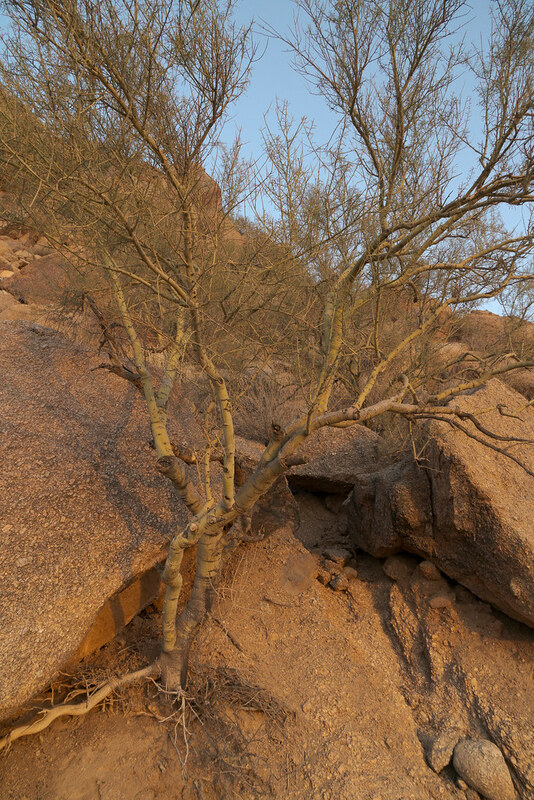 A lovely palo verde grows beside the large rocks of a boulder field at Pinnacle Peak Park, I am constantly amazed at the places life can flourish. 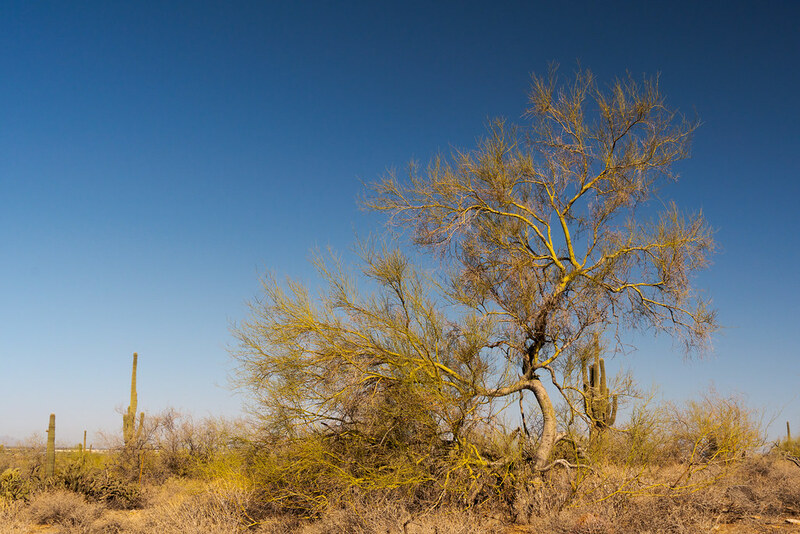 The Sonoran Desert is so lovely bathed in the soft morning light. As soon as I arrived in Arizona for my interview in February I was struck by the green trees I saw as I drove around town. 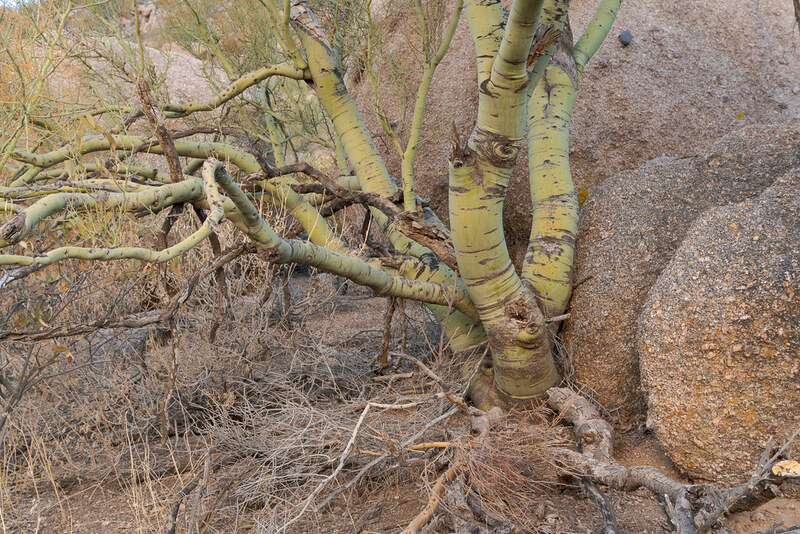 The palo verde is the state tree of Arizona, the green in the bark contains chlorophyll so they can use both bark and leaves for photosynthesis. 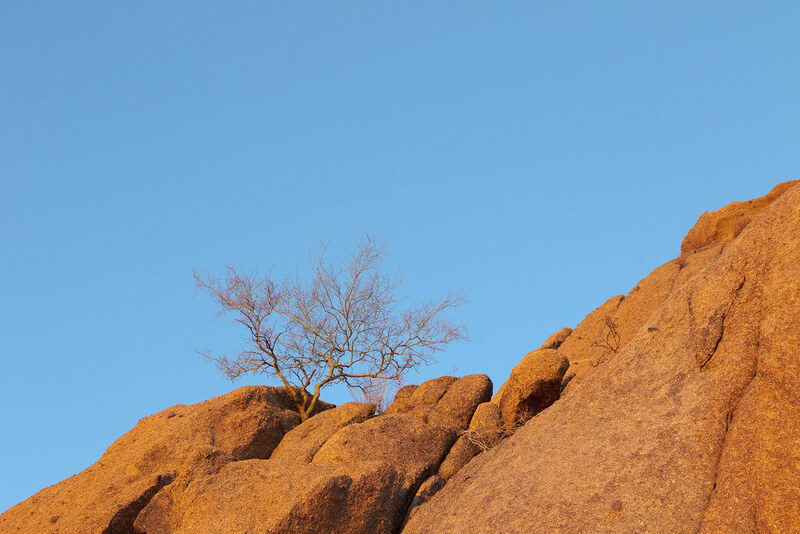 I came across this one shortly before sunrise when I visited Pinnacle Peak Park in Scottsdale. We have accomplished a lot in the past six weeks but there is still a lot to do, I feel a bit like this tree, sprawling in all directions, a bit worse for the wear, but still standing, still growing.